The Cotswold town of Northleach in Gloucestershire is located at an important crossroads, just off the roman road, the Fosse Way (A429) 10 miles north-east of Cirencester and 10 miles south-west of Stow-on-the-Wold. 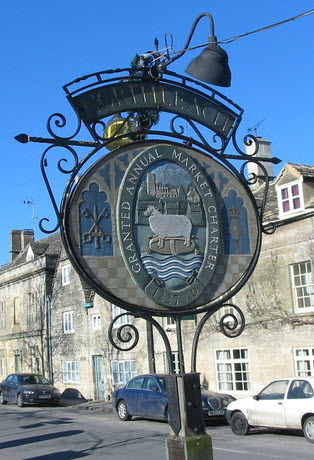 Northleach was at one time a great market town, celebrated throughout Europe as a major centre for the Cotswold wool trade. The fifteenth-century church of St Peter and St Paul, paid for by the wealth wool merchants, was built with stone dug from the quarry in the town itself and what is now the Market Square. Northleach Church of St. Peter & St. Paul is beautifully embellished with carved stonework and it contains the best of all Cotswold churches memorial brasses depicting its benefactors, some of whom are shown standing on the woolsacks and sheep that made them so rich. The church is one of the most beautiful of the Perpendicular ‘wool’ churches in the Cotswolds; its south porch has been called the most lovely in all England, with its tall pinnacles and statue-filled niches. One of the church's greatest glories is the giant east window which floods the church with light and also a generous "Cotswold window" over the chancel arch. 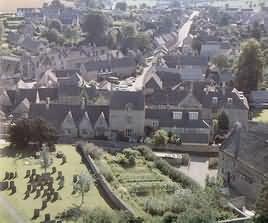 The modest size of the town of Northleach belies its former importance. The Abbey of Gloucester owned the area from AD 800, granting the town a charter in 1220 to hold a weekly market. The town was transformed by the wool trade and in 1340 to 1540 it flourished as the centre of a large sheep-rearing area. Northleach has long been linked with transport and in about AD300 the Salt Way trade route came through the town, used for carrying salt by packhorse from salt mines at Droitwich to the River Thames at Lechlade and the on to London. During the age of coach travel it was a centre for changing horses and refreshing passengers on the London to Gloucester route. Annual Northleach Charter Fair and Music Festival - The Charter Fair is 788 years old, dating back to 1227 when King Henry III granted the town of Northleach a Charter which allowed a weekly market and an annual fair. The Charter Fair is always the last Saturday of June, that being the closest weekend to the feast day of St Peter and St Paul. The Wyvern Mysteries (1999) was part filmed at Northleach - Based on a 19th Century writer JS Le Fanu, about a young girl brought up by the man responsible for her fathers death. She falls in love with his eldest son. Starred: Derek Jacobi, Jack Davenport. Touring by car - Cirencester, Stow-on-the-Wold, Bourton-on-the-Water, Chastleton House, Moreton-in-Marsh, Chedworth Roman Villa, Painswick, Sudeley Castle at Winchcombe, Broadway, Chipping Campden, Burford and Bibury, Hidcote Gardens, Rollright Stones. 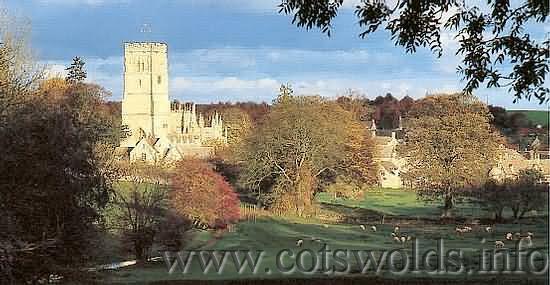 Walking - the area is a walkers paradise with many beautiful walks across open Cotswold countryside. Relaxing and enjoying the slower pace of life and indulging in the English passion for tea and cream cakes in the many tea shops in the nearby villages and ancient towns whilst soaking up the ambience of the 16th and 17th centuries. Every Wednesday. 8.30am - 2.00pm FREE PARKING! The Stowell Park Estate is a private agricultural and sporting estate in the heart of the Cotswold Hills close to Northleach (2 miles) and to the west of the Fosse Way where it joins the A40. The Estate has been owned by the Vestey family since 1921. It extends over 5,500 acres of grassland, arable and woodland on both banks of the river Coln. There are very good inter-connecting public rights of way. The owner is Sam Vestey, 3rd Lord Vestey, the great grandson of 1st Lord Vestey, is the current head of the family and Chairman of the Vestey Group. Although Stowell Park is a private house the gardens are open to the public in May and June each year, and there are occasional charity events in the gardens. The gardens include beautiful lawned terraces with fine views over the Coln Valley. Old-Fashioned roses and herbaceous plants. Two large walled gardens containing vegetables, fruit, cut flowers and range of greenhouses. Long rose pergola and wide, plant-filled borders divided into colour sections. Proceeds divided between Yanworth Village Church & Royal British Legion. During the second world war Stowell Park was turned into a camp for prisoners-of-war. Lowry also painted The Market Square in Stow-on-the-Wold, the church at Burford, 'The Green' at Northleach and Moreton-in-Marsh high street.